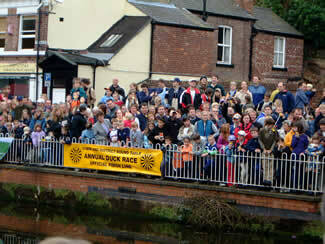 The crowds gathered at Lymm Dam to watch the launch of hundreds of ducks into the weir at Lymm Dam. Traditionally Stockton Heath Fire Brigade assists the launch, however this year they were called out on a "shout" and could not attend the event. 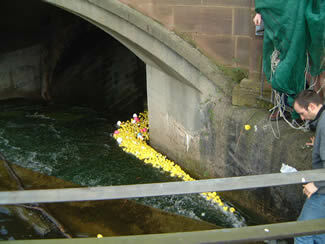 Instead Lymm Round Table, the organisers, undertook the launching of the numerous ducks and they had no trouble negotiating the weir to cascaded down the gorge and float down through the Dingle, some more slowly than others, to finally reach the end of the race at the Lower Dam in the village. 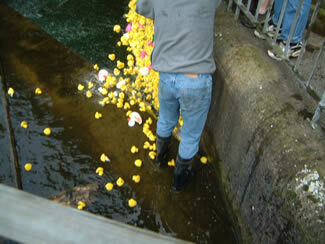 The crowds played their part by cheering the ducks on their way and blowing "quickies" of encouragement. 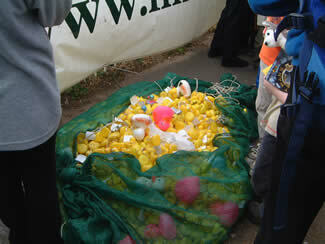 The funds raised are going to be donated to local charities - Riding For The Disabled and The Lymm House Bound. 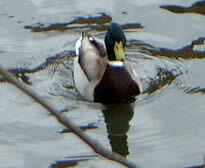 A quacking good time was had by all. 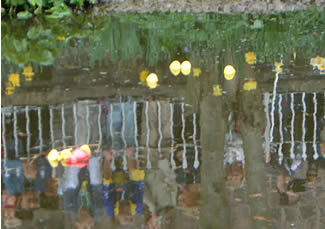 Thanks to everybody who sponsored and supported the event.